"This didn't even happen during the so-called Storm of the Century in 1993," said Yaritza Mendoza, the floodwaters lapping around her knees. "We've never seen the water reach Linea before." For those not familiar with the beautiful Havana district of Vedado, the street name of "Linea" might not mean much, but for residents of the Cuban capital it is one of the city's reference points. For days, much of this most treasured neighbourhood has been submerged. Hurricane Irma brought water and debris crashing over the seawall of the Malecon, Havana's waterfront boulevard, and into the district's art deco and modernist buildings. Once the storm surge hit Linea, it was some six blocks up from Malecon. Ground floor apartments were inundated, possessions ruined, and entire livelihoods were put at risk among those running small businesses from their homes. 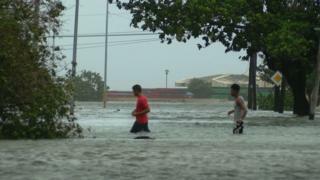 The streets of Vedado briefly became canals, with the emergency services going from home to home by boat to rescue the elderly and infirm. In that regard, Yaritza, who lives on the tenth floor of a building on Linea, considers herself fortunate. "Thanks to God, I've not heard of anyone that has died but there have been very big material losses," she says, her children wading through the fetid water in bare feet or flip-flops. Then, as we are speaking, a forensic team arrives to remove the body of Nieves Martinez, an 89-year-old whose body was found floating in the waters outside her home. It was a tragic and timely sign of what the government would later confirm via state media: there were 10 deaths in Cuba as a result of Hurricane Irma. Elsewhere in the city, in the much poorer district of Centro Habana, Yolendis Castillo and Maria del Carmen Arregoitia - both aged 27 - died when a fourth floor balcony collapsed on a bus in which they were travelling. As many local residents make their way through floods to get in and out, Havana remains a city largely in the dark. The fear is that it could take weeks to for the power to be fully returned. All of this, and Hurricane Irma really only grazed Havana. 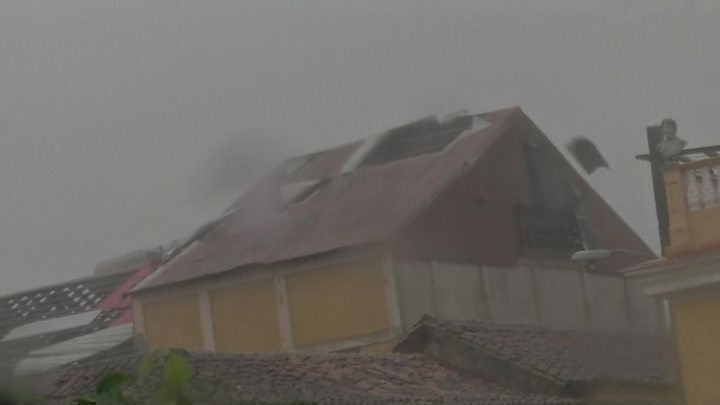 The areas further east, which were directly under the eye of the storm were devastated - particularly the fishing village of Caibarien and the outlying keys such as Cayo Coco. Images released by state media show the roof of the international airport in Cayo Coco caved in. Incredibly, visitors were flying into that airport as recently as Wednesday, just a day before the key was evacuated in a convoy of buses. Gill Wilkinson from Nottinghamshire was among them. "It was truly frightening," says Gill, adding: "They really should have got us out earlier. We saw the Canadians leave, the Argentines leave and we were all sitting that hotel and with no-one telling us anything." Now in a hotel in Varadero, a resort much closer to Havana, she is part of a group of British holidaymakers who are fuming at their travel agent, Thomas Cook, and the British Foreign Office. "The Cuban people were the only ones who've actually looked after us", said Angelique Wood, another stranded visitor from Derby. Thomas Cook has defended itself saying the company followed the Cuban government's emergency instructions to the letter. Meanwhile the British Foreign Secretary, Boris Johnson, described as "completely wrong" the criticism that the UK government's response to the crisis in the Caribbean was slow or inept. Still, no-one should confuse matters. Hurricane Irma in Cuba is not about disgruntled holidaymakers, no matter how difficult the past few days have been for them. It is about the families of Nieves Martinez, Yolendis Castillo, Maria del Carmen Arregoitia and seven others. It is about entire communities wondering how they are going to rebuild when they were among some of the poorest on the island in the first place. It is about swathes of Cuba facing uncertain months ahead, possibly trying to cope in the dark. The rebuilding of key infrastructure will take time and money that simply doesn't exist. President Raul Castro praised the Cuban people for their response to the disaster so far and promised to reconstruct after the damage. "In these difficult circumstances, of greatest importance is the unity between Cubans, the solidarity between neighbours, and the discipline before the instructions emitted by the National Civil Defence and the Defence Council at every level," he wrote in a letter to the nation. Yaritza Mendoza will also be turning to another power. "We just have to have faith that God is going to help us," shaking her head at her flooded neighbourhood.